Chicago’s favorite summer tradition, Chicago Shakespeare in the Parks brings Shakespeare’s Greatest Hits, free for all, to audiences in 18 Chicago neighborhood parks throughout the city. Shakespeare’s memorable characters come to life in a unique and surprising mash-up of scenes from his most celebrated plays—from Romeo and Juliet and Macbeth to The Taming of the Shrew and As You Like It. In its fourth year, Chicago Shakespeare in the Parks inaugurates cultural programming in a newly created Chicago Park District park—Steelworkers Park, a former industrial site now reclaimed as public green space in the Calumet region. The transformation of this 10th Ward site has been hail by environmentalist, community groups and urban planners alike. The citywide tour is made possible by a renewed civic, cultural and corporate partnership between Chicago Shakespeare Theater, the City of Chicago, Chicago Park District, Boeing and BMO Harris Bank. 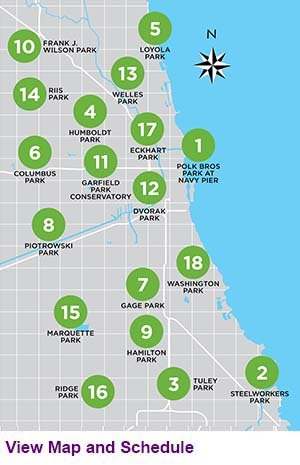 Since the inception of the Chicago Shakespeare in the Parks program, nearly 50,000 Chicagoans have taken advantage of free performances in their communities. Read a short summary of this year's Chicago Shakespeare in the Parks tales featured in this unique mashup.